Yeovil Town manager Paul Sturrock has called his side "heroes" after they battled to an FA Cup first-round victory over Maidstone with nine men. Wes Fogden's goal sealed the win over the National League South side - their first victory since 19 September. It came after they had Jakub Sokolik sent off after just seven minutes and lost Artur Krysiak in the 56th minute. "Every one was a hero, they worked their tail off from start to finish," Sturrock told BBC Somerset. "I've never played in a game where I've had nine men. 10 men yes, but not nine," the 59-year-old said. "Everyone wore their heart on their sleeve. This is a hard place to come, with decent players, they were probably favourites to win the game and my players showed great resilience and did all the right things. I'm proud of every one of them." 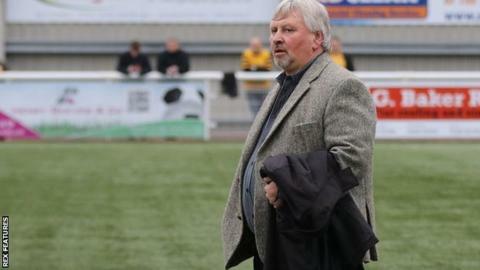 Sturrock, whose side are 23rd in League Two, now hopes the result can kick start their season. "We're in the draw for the next round and I'm hoping this could be a fresh start and the start of a run for us," he added. "The way we got it will be a huge boost. Teams normally capitulate with nine men but this lot are made of stern stuff and I'm pleased they were still biting and scratching at the end, it would have been easy for them to keel over for another defeat."